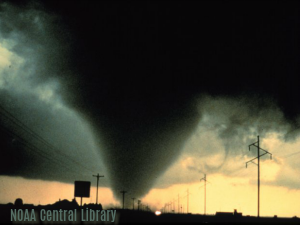 Collin County sits inside the U.S.'s famed Tornado Alley and Dixie Alley. Click here for maps. If you've moved here from an area where tornadoes are not a common threat, let me assure you that you need to take the threat of tornadoes seriously. We'll share with you where to take cover in a tornado, the difference between a tornado watch & a tornado warning, tornado "season", and more. If a tornado warning is issued in your area: Take cover now! If a tornado watch has been issued in your area: Be on the lookout. From the National Weather Service: "Watches are issued by the Storm Prediction Center for counties where tornadoes may occur. The watch area is typically large, covering numerous counties or even states. Tornado Warning: Take Action! A tornado has been sighted or indicated by weather radar." When is "Tornado Season" in Collin County? Tornadoes can hit without warning on beautiful, sunny days or during a violent storm. Click here for warning signs of a tornado from the Storm Prediction Center of Norman, Oklahoma. Tornadoes may approach from any direction. Tornadoes can also change direction mid path. Where Should I Take Cover During a Tornado? Most of our homes in this area are built without basements, so the best we can do is go to the lowest floor, a room in the center of the house such as a closet or bathroom without windows. Cover with thick padding (mattress, heavy bedding) and if available, wear a helmet. 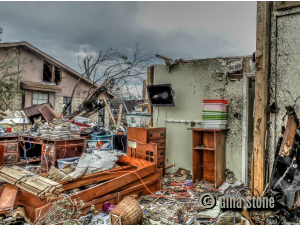 The greatest number of injuries during a tornado are the result of flying debris. Detailed safety tips may be found here. What is the Fujita, or F, Scale? The short answer is that this scale measures the significance of a tornado with the lowest rating "0" to the highest rating "5". For detailed information on both the historical Fujita Scale and the Enhanced Fujita Scale, click here. There are a lot of myths about tornadoes which will not be listed here lest you remember them as fact. Links are provided below. As with any potential disaster, taking the time to make a plan for your family could result in a successful outcome. Identify the safest location in your home during a tornado warning, arrange where you will meet after the storm, keep protective coverings near your shelter space (sleeping bags, heavy blankets, helmets), and practice the drill with your family at least twice per year. Also discuss with your family what to do if not at home. Identify an emergency contact person out of state in case cell services are down and family members in the immediate area are difficult to reach. If you'd like to see a map of the tornadoes in Collin County, one has been provided here by the Tornado History Project. Answers to just about every question you've ever entertained about tornadoes. Map of tornadoes in Collin County from 1950-current. Also includes data of tornadoes by rating, intensity, month and time of day and historical number of tornadoes per year. Gina Stone arrived on scene immediately following the tornado that hit Garland. She provided these to Collin County Guide. The last photo was provided by NOAA.